Just yesterday Amazon Web Services had another serious outage. This one took down Netflix, Hipchat, Yelp & even Experian. Many people thought the internet itself was down! Does it feel like Amazon *is* the internet? Are they too big to fail? Not already a subscriber? Get Scalable Startups monthly. Signup! Hiring? 8 questions to ask an Amazon Web Services expert. Blogging? Why pagerank is important & how to improve it. See also Top MySQL DBA interview questions. Using replication? Why MySQL can lose data. Learn to bulletproof Replication with our handy guide. Managing MySQL? Our Accidental DBA Guide to MySQL is written with you in mind. We've got a lot more on offer, check out our Best of... compilation of content hits. Fred Wilson recently a post Loyalists vs Mercenaries. It made me think of Reid's book. Are you a loyalist of one? 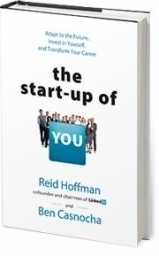 Are you running the startup of you? Copyright © 2015 iHeavy, Inc., All rights reserved. unsubscribe from this list | update subscription preferences | signup here!